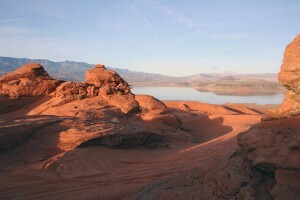 Sand Hollow Reservoir, sand dunes, and Navajo Sandstone, viewed from Sand Mountain. Virtually every geology student is introduced to the phrase “the present is the key to the past,” a summarization of one of the underlying principles of geologic interpretation, the principle of uniformitarianism. 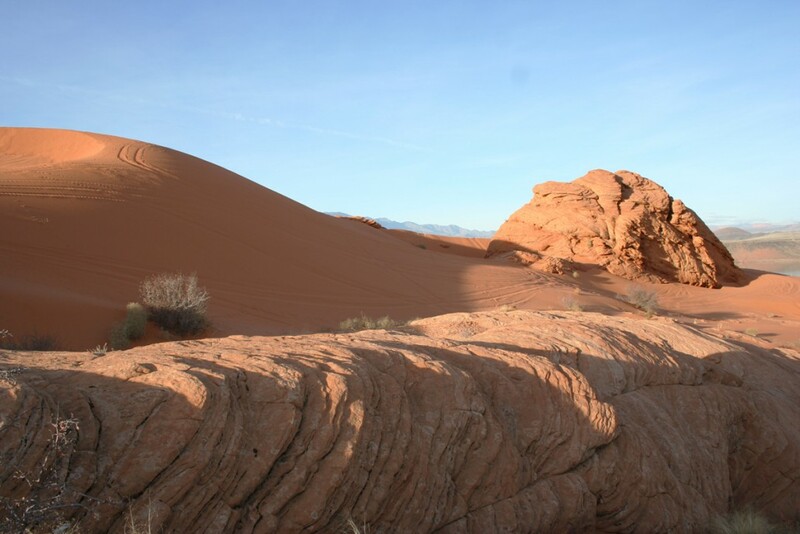 A strikingly obvious place to see the geologic present juxtaposed with the geologic past is Sand Mountain, immediately south of Sand Hollow State Park in Washington County, where modern, active sand dunes blow across ancient, “petrified” dunes of Navajo Sandstone. 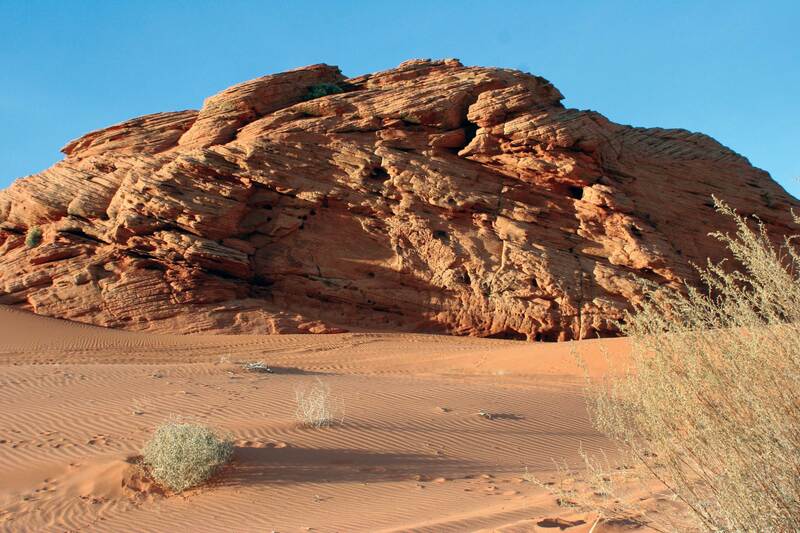 Small amounts of hematite, a rust-like iron mineral, coat individual sand grains and color the rock reddish orange. Note the exposed multidirectional cross-bedding due to changing wind directions. The vistas from this GeoSight are as interesting as the geology underfoot. Looking to the northeast, one-million-year-old black basalt caps the bluff on the far side of the reservoir. The brown hill just beyond the bluff is a 350,000-year-old volcano. The cliffs of Zion National Park can be seen in the distance. 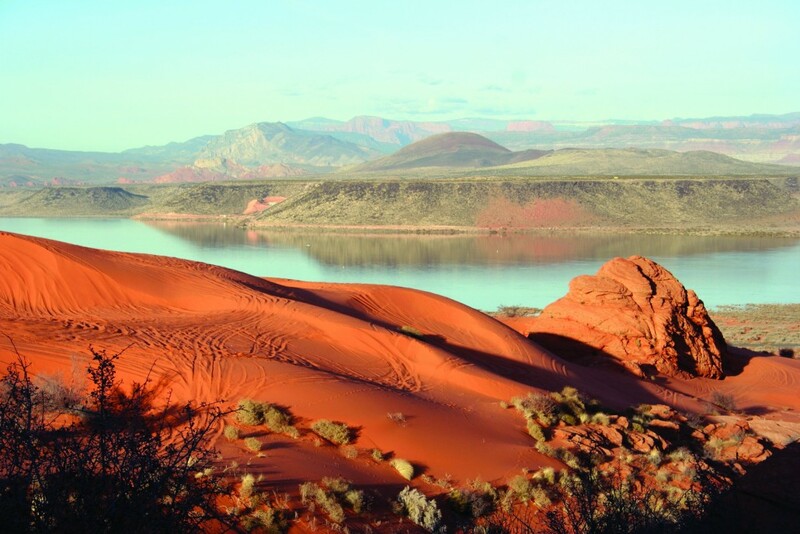 And then there’s the water: completed in March of 2002, Sand Hollow Reservoir is an off-canyon reservoir filled with water diverted from the Virgin River after it flows out of Zion National Park. 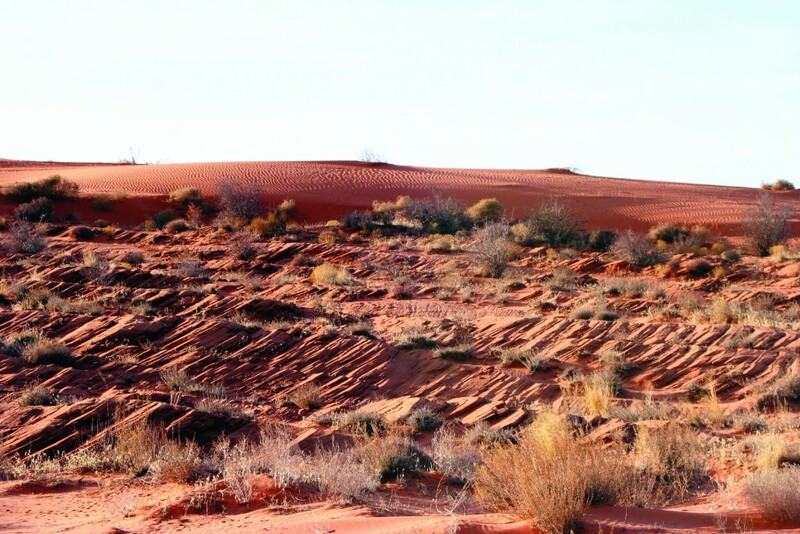 Why a reservoir in a shallow sandy basin underlain by porous sandstone? The reservoir is designed to supply water to the Navajo Sandstone aquifer for storage and later retrieval from wells located off site. From I-15 in southwestern Utah, take exit 16 and travel east toward Hurricane. After approximately 4 miles turn right on Turf Sod Road (just past the wastewater treatment ponds). 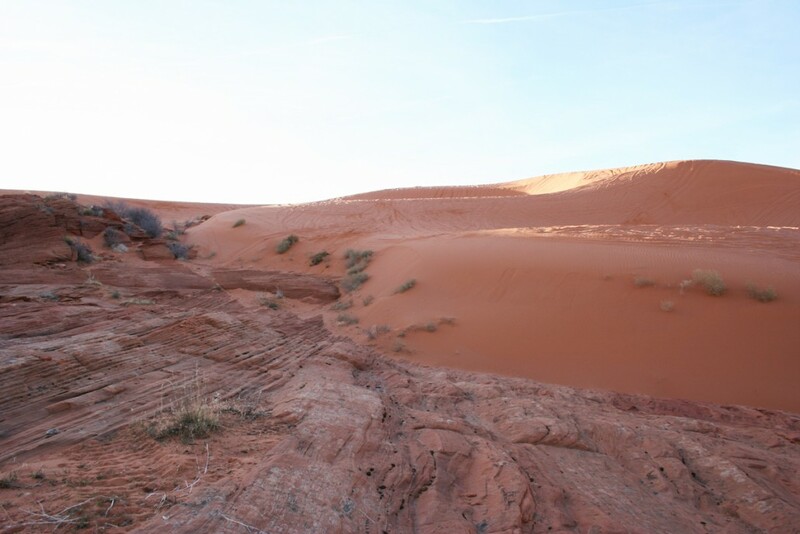 Turn left after approximately 1 mile and stay on the paved road past the Sand Hollow State Park main entrance. Stop at the sand dunes, but mind the “No Parking” signs.